Record Description The hoard of Roman coins was unearthed in 1988 by a metal-detectorist in a field next to Scarr House, on Swale Hall Lane to the west of Grinton. 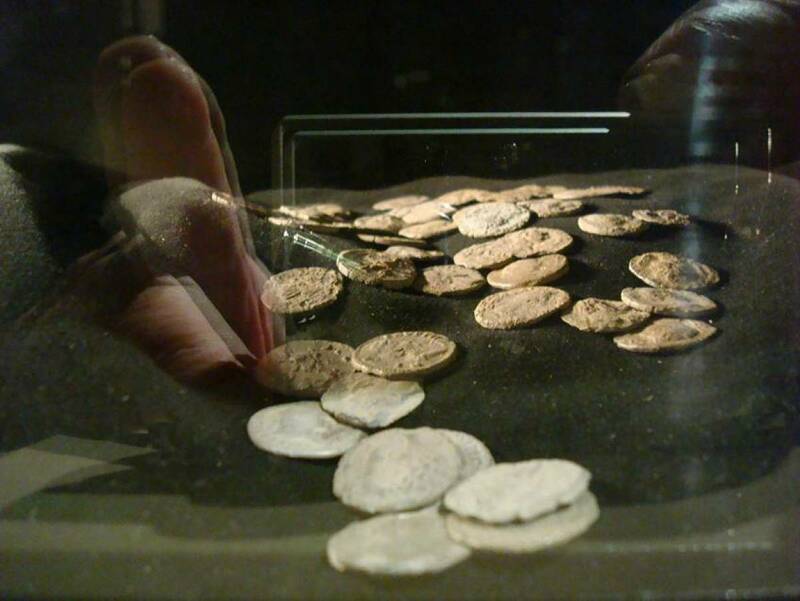 The coins are thought to have been buried in an organic container because none was found. They were declared treasure trove and placed in the custody of the Yorkshire Museum. Shortly afterwards they were analysed and described by P J Casey and P Wenham (A second-century denarius hoard from Grinton, North Yorkshire, in Yorkshire Archaeological Journal vol. 62, 1990, p9-11). They described 53 recognisable coins, with issue dates spanning 74 to 169 AD, and noted nine illegible fragments of coins. Casey and Wenham concluded that the Grinton find seemed to fit with the general distribution of Roman coin hoards, also that it was similar to finds from all periods of the occupation, and so it was probably not related to any extreme event such as attack or rebellion. The coins are currently on display in the Time Tunnel of the Dales Countryside Museum in Hawes (item HAZFM 1578).